1) So Jay, being born and bred in Manchester, is it fair to say that Manchester as a cultural hub has been a huge influence on your art work? I’m a Manc through and through, I reckon if you sliced me into bits it would say Manchester through every bit. Like Blackpool rock. 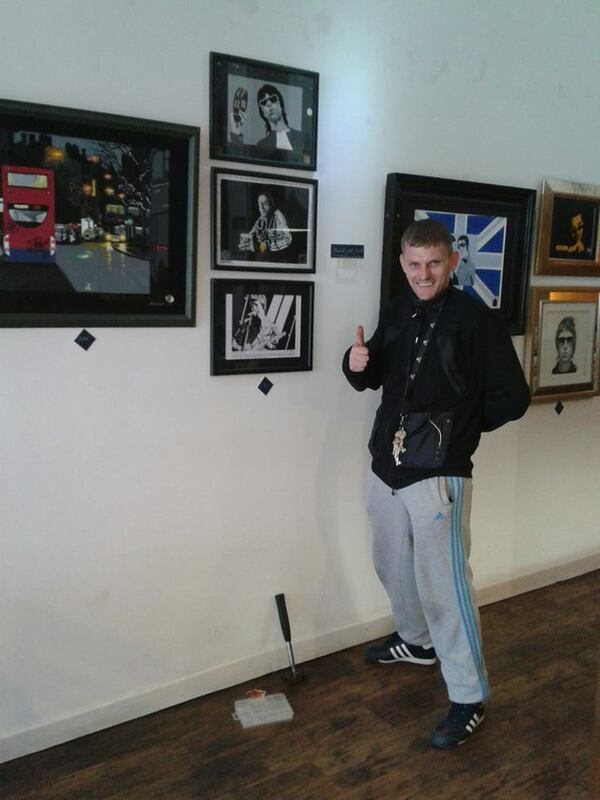 2) You’ve painted some of the biggest names in Manchester, from Liam Gallagher, to Ian Brown and Tony Wilson. Is there a particular painting that you are really proud of? Hmm… it all started with Liam Gallagher. He and I used to be friends in the olden days, I was sentenced to ten years and he went on to shake the world so I just painted the guy because he was me mate and people that saw it said it was ace. But I mainly just paint Mancs that I rate for getting off their arses and doing something. 3) Is there any musician out there that you would love to paint but, its just a case that you haven’t got round to it yet? There are loads of Mancs I’m going to paint but the frustrating thing for me at the moment is that I have to paint people from other people’s photos. The stuff I’m gonna be working on soon is Manchester today like “The Moods”, “The Joint”, “Ryan Jarvis”, “Ian Tilton”,”Mita” the “Dutch Uncles”. These guys really excite me as an artist.. they’re accessible and I can capture more than just an image and there going places and doing things not just sitting round the estate getting high. I hope one day to get my own images of Ian Brown. 4) Apart from musicians and public figures, you have also painted buildings and landmarks from around Manchester. Is there a particular painting which tells a story or captures the spirit of Manchester? Strangeways and myself have a love hate relationship. I can see it from my front door. I love Mancunian architecture and whenever I walk past Strangeways (twice a day) it makes me feel good inside because I’m on the outside of those immovable walls n I’ve spent most of my life inside and rightly so… my behaviour was unacceptable. I have been on the straight and narrow since my release in 2005. Beetham Tower is another fave… I see them as giants. 5) As an artist, do you prefer to use a particular method or technique or is it a case of experimenting as you go along? Initially I was a straight up painter… oil on canvas but since I got my studio in the Northern Quarter I have met so many artists and picked up loads of different skills. Aylo from Dirty Work in Afflecks has been a massive help and inspiration. My prints are now on sale in Dirty Work and I have been learning about spray paint… heavy paint champ Tony Kelzo also been ace, a real cool cat. I think he must have been born with a can in his hand. Everyone has been amazing round there. I can’t even explain what it means to me. 6) Have you got any plans to exhibit your work? At the moment I’ve got some of my work exhibited at Chai Latte Cafe in Manchester (big thanks to Fez). In the next 2 or 3 months I’ll also be exhibiting my work at 20 / 22 Gallery. Only in Manchester eh.